OCEAN CITY, MD – (August 29, 2018): Chief Ross Buzzuro of the Ocean City Police Department (OCPD) is proud to announce the promotion of Lieutenant Elton “JR” Harmon to the rank of Captain. Captain Harmon will fill the position of Support Services Division Commander, formerly held by Retired Captain Greg Guiton. Captain Harmon, originally from Baltimore County, joined the Ocean City Police Department in 1996 as a seasonal police officer and was a part of the first class of seasonal police officers to be trained in bicycle patrol in 1997. Captain Harmon was hired as a full-time officer in July 1997. 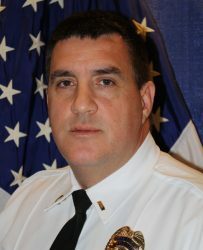 Since then, he has served the department in several capacities, including Patrol Sergeant, Acting Patrol Lieutenant, Assistant Commander for the Support Services Division Services Management Section, Special Projects and Community Services Lieutenant, and most recently Assistant Commander for the Criminal Investigation Division. Captain Harmon has also served as the Defensive Tactics Unit Coordinator, departmental armorer, and a 20-year veteran of the OCPD’s Quick Response Team. Captain Harmon has had thousands of hours of law enforcement training. Most notably, he is a graduate of Northwestern University Center for Public Safety Executive Management Program. During the course of his career, Captain Harmon has earned several awards from his superiors and the Ocean City community for his accomplishments and dedication to public service. In addition to Captain Harmon, Sergeant Dennis Eade has been promoted to the rank of Lieutenant and is now the Watch Commander for the Midnight Patrol Shift. Lt. Eade began his career at OCPD as a seasonal police officer in 1997 and was hired as a full-time officer in 2000. During his tenure, he has been assigned to every division in the department, including training, narcotics and vice, and plain clothes assignments.